I started my career with Wetlands International (then Asian Wetland Bureau) in Malaysia in 1991 where I coordinated the Asian Waterbird Census. 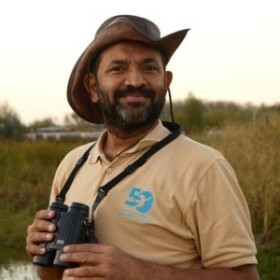 I am a Senior Technical Officer focused on waterbird biodiversity, as well as Councillor for Asiatic Fauna to the Convention on Migratory Species (CMS) Scientific Council and Chair of the CMS Flyways Working Group. I developed and coordinated the Asia-Pacific Migratory Waterbird Conservation Strategy, the largest international cooperation framework for migratory waterbirds and their habitats in the region. In late 2000s, I helped the UN FAO build a programme to strengthen the capacity of veterinarians and wildlife staff in wild bird disease monitoring in Africa, Europe and Asia. My Master’s degree is in Microbiology from Pune University, India. I hold a PhD in waterbird ecology from Saurashtra University, India, where I made a switch to my real passion for birds.